or I can call you if you give me a cell phone number. People from 171 countries have visited Bob Links. Click here for the seating chart from the Ticketmaster site. 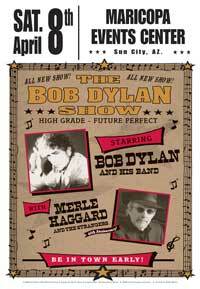 (a password is required for the presale and can be found on the Bobdylan.com page. It is usually posted on the day of the presale. Click here for the link to the presale tickets. Tickets will go on sale to the general public through Ticketmaster on Saturday, March 11 at 10 AM. Tickets will go on sale to the general public through Ticketmaster on Saturday, March 25 at 10 AM. Address: 527 N. Grand Blvd. Tickets will go on sale to the general public through Metrotix.com on Saturday, March 18 at 10 AM. General admission tickets will go on sale to the general public through Ticketmaster on Friday, March 24 at noon. Reserved seats will be available through the Val Air box office on March 24 at noon. Click here for the seating chart from the Metrotix site. Tickets will go on sale to the general public through Metrotix.com on Saturday, March 25 at 10:00 AM. Tickets will go on sale to the general public through Ticketmaster on Saturday, March 18 at 10 AM. Plans for a club show at a club in Baton Rouge and another at a club in Lafayette have been cancelled. There will not be a club show on this date. Tickets will go on sale to the general public through Ticketmaster on Saturday, March 18 at 10:00 AM. Presale tickets will go on sale to students through the box office on Tuesday, March 21 at 5:00 PM. Tickets will go on sale to the general public through the box office by phone or on their web page on Saturday, March 25 at 10:00 AM. This is a benefit concert to raise money for the restoration of the Bijou Theatre in Knoxville. Tickets will go on sale to the general public through Tickets Unlimited or through Tickets.com on Friday, April 7 at 10:00 AM. Tickets will go on sale to the general public through Ticketmaster on Saturday, March 25 at 10:00 AM. Tickets will go on sale to the general public through Ticketmaster on Saturday, April 1. Tickets will go on sale to the general public through on Saturday, April 8 at 10:00 AM. Tickets will go on sale to the general public through Ticketmaster on Friday, April 7 at 5:00 PM. Tickets will go on sale to the general public through Ticketmaster on Friday, March 31 at 12 Noon. Tickets will go onsale on Thursday, March 16 through www.ticketmaster.ie at 9:00 AM and by phone. Free admittance for 60+ year olds on Sunday, July 2..
Tickets can also be ordered here. Tickets are now on sale through General Tickets. Tickets are also available through Gemerco. Tickets are also on sale through E l Corte Ingles. Tickets are now on sale through E l Corte Ingles. and by phone (Spain only) at 902 22 44 11. Some reserved seating in bleechers on the side. The rest of the tickets are general admission and are free. Tickets are on sale through Estes. This may be for local sales only. Tickets went on sale through Ticketone.it on Thursday evening, June 15, 2006. Also scheduled to appear: Jimmie Vaughan, Junior Brown, Elana James & The Continental Two. Tickets will go on sale to the general public through Ticketmaster on Saturday, July 8 at 10:00 AM. Tickets will go on sale to the general public through Ticketmaster on Saturday, July 15 at 11:00 AM. Tickets will go on sale to the general public through Ticketmaster on Saturday, July 15 at 10:00 AM. Tickets will go on sale to the general public through The PawSox web site on Saturday, July 15 at 10:00 AM. Tickets will go on sale through Ticketmaster on Saturday, July 15 at 10:00 AM. at Lubrano Park indoors to the Bryce Jordan Center at University Park. Tickets will go on sale to the general public through Ticketmaster on Saturday, July 22 at 10:00 AM. Tickets will go on sale through Ticketmaster on Saturday, July 22 at 10:00 AM. Tickets will go on sale to the general public through Ticketmaster on Saturday, August 5 at 10:00 AM. Private concert for employees of Genentech. as part of an event marking the 30th anniversay of the company. Other performers included the Foo Fighters, Black Eyed Peas and the Eagles. A hot seat package through Ticketmaster will go on sale to the general public on Tuesday, September 5 at 10:00 AM. Tickets will go on sale to the general public through Ticketmaster on Saturday, September 9 at 10:00 AM. Tickets will go on sale to the general public on Saturday, September 9 at 10:00 AM. Tickets will go on sale to the general public through Ticketmaster on Sunday, September 10 at 10:00 AM. A hot seat package through Ticketmaster will go on sale to the general public on Monday, September 25 at 10:00 AM. Tickets will go on sale to the general public through Ticketmaster on Monday, September 25 at 10:00 AM. Tickets will go on sale to the general public through Ticketmaster on Friday, September 8 at 10:00 AM. Tickets will go on sale to the general public through Ticketmaster on Saturday, September 16 at 10:00 AM. Tickets will go on sale to the general public September 9 at 10:00 AM. Tickets are on sale to the general public through Comcast Spector Corp.
Tickets will go on sale to the general public on Friday, November 10 at 10:00 AM.